It is to be understood here, that quite unlike the metal interference systems, CLCs can develop their color reflection through a single layer only. 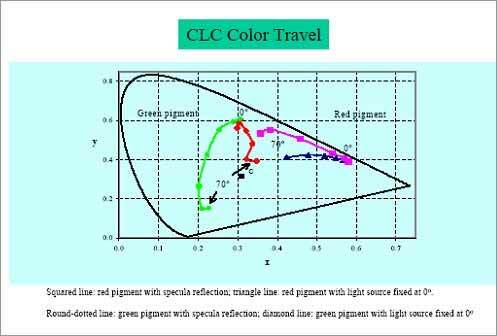 CLC pigments show very good blue-shifting color travel as illustrated in this graphical representation. As CLC pigments are manufactured using polymeric material, and their optical properties mostly determined by CLC mixtures only. Features like control of band width color fine-tuning, special wavelength design, etc. becomes relatively easier as compared to those using traditional interference technology. CLC pigments are basically circular polarized that can create a secondary detection mechanism that is very simple. In the case of CLC based flakes, center wavelength can be adjusted with ease thus enabling a vast set of custom products. CLC pigments are produced by using a continuous film based polymerization, this allows for considerable cut in expenditure as compared to vacuum deposition technologies. Every CLC pigment comes with circular polarization, that facilitates simple detection mechanisms like opposite handedness extinction. This features is unique to CLC pigments. Owing to the periodic structure of CLC films, CLC pigments has in it a strong color travel effect. CLC pigments are increasingly applied as a deterrence for counterfeit in banknotes, securing documents, and in authentication processes to protect brand and products. Light that is reflected from a CLC is circularly polarized, this effect finds very popular application in security and machine read applications.